You can just run Help-Network Diagnostics and see what it says. Or troubleshoot it manually, step-by-step. The diagnostics essentially do what is described below, but sometimes you just need to know more. So this is a list of things to try. Diagnostics are run once upon installation. You can run them again (Help->Diagnostics). You may need to reset your router by cycling the router power if you change settings from the defaults. UPnP settings are removed when the program is stopped to keep your system safe. I use Universal Plug And Play (uPnP) and several diagnostics to configure compatible routers automatically. uPnP may be disabled, or fail. If your router does not support uPnP, you must manually open ports in your router and Port Forward them to your PC. Go to Settings -> Expert mode, click the DNS button at top left, and enter '127.0.0.1'. Then restart the grid, and use http://127.0.0.1:8002 as the grid in the viewers "Add Grid" menu. You should also be able to see the Systems admin web page with a viewer by clicking the above link. Open up your viewer. Now add the grid http://127.0.0.1:8002 to the viewer. You should now be able to log in on the Server from the Server. You should see the Welcome region spit out a lot of text as you log in. If this fails, it is not your network, router, or loopback. You probably forgot the password. You can rest it it with the command 'reset user password' in the Robust screen. Accessing the Hypergrid easily requires a compatible uPnP router with loopback. If your router does not support loopback, you can still join the hypergrid by installing a special pointer in /etc/hosts or a special Windows Device Driver. Additional information about known good and known bad routers is available online at the Opensimulator site. You can add, delete and modify the settings without a password, assuming you have uPnP enabled. 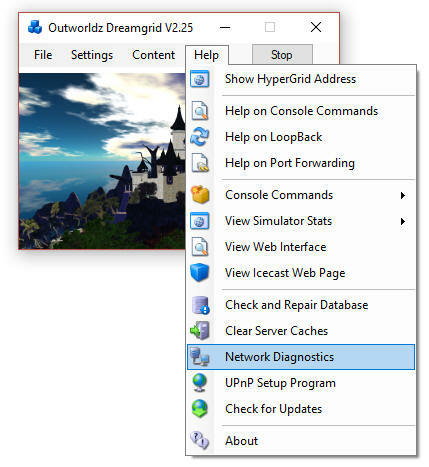 This is included in Dreamworld and Dreamgrid in the Help menu. You can still manually forward ports. Windows will prompt you to allow Opensim to open ports when it first runs. If you say no, you will not be able to log in. If you are using an Anti-virus with a firewall, such as ZoneAlarm, AVG Internet Suite, or anything else, running Start.exe my trigger the 3rd party firewall popup warnings. Opensim.exe needs to be allowed internet access, and Start.exe should be allowed to make changes. This code is digitally signed by me, Fred Beckhusen of Outworldz.com, and is open source and available for inspection on https://www.github.com/Outworldz. You may also have to manually add firewall rules to allow incoming traffic on the ports. 1. On the client operating system, go to Start>Run and type firewall.cpl. The Windows Firewall window opens. 2. Click on the “Advanced Settings” link on the left pane. The Windows Firewall with Advanced security window opens. 3. Click on the “Inbound Rules” option. 4. On the left pane, click on “New rule”. 5. Under “Rule Type” select the option “Port” and click next. 6. Select “TCP”and “specific local ports” options. 9. Select the option “Allow the connection”. 10. Click Next, do not change any option here and click Next again. 11. Specify a name for this rule. If it will acts wonky or is missing files, look in Help->Check for Updates. If it crashes and you cannot get to the updater, try a manual update. Save the following EXE in the folder where start.exe is and run it. It will repair any missing files. There are two versions, one for Dreamworld, and one for Dreamgrid. Be sure to use the correct one. If you have valuable content in your sim, make a copy of the entire folder somewhere, first. It will have copies of the region files and database we can recover if it is still broken. Your Mysql database may be crashed. This is a way to start MYSQL manually. Navigate to the Outworldzfiles\mysql\bin folder. Press and hold the Shift Key and right click the BLANK area next to the files. Or navigate there, as I did below, by typing in commands. Then run "StartManually.bat"
Any error message it prints may be be helpful. If the above DOS window closes, a MySQL LOG file will be saved in OutworldzFiles\mysql\data as a *.err file. That wil give you a clue as to what to do. My database still did not start. Try running Outworldzfiles\mysql\bin\Repair_ISAM.bat. You can wipe ALL data out and recreate it from OAR and IAR files. This WILL LOSE ALL DATA. If you MUST wipe out the database and start over, delete the ib_logfile0, ib_logfile1 and ibdata1 file in OutworldzFiles\mysql\data ( leave the folders). Then delete just the contents of data\opensim\*. Leave the folder "mysql\data\mysql" alone. This will make it start over at the very beginning and you need to re-enter your Avatar name and password and reload everything. Here is more detail about ports and they way the interact with the outside world such as www.canyouseeme.org and to my diagnostics tests. Put simply, only port 8002 can report back to those tools as to being open, and can do so only when Opensim is running. 8001 is a TCP/HTTPport that is open for help->Network diagnostics. It is unique to Dreamworld. It is used for a "port forward" test, just like Canyouseeme.org does, and for a loopback test. It also collects data on sim's going up ad down. Opensim has a web server that web browsers understand, using the same protocol (TCP/HTTP) that tools like www.canyouseeme.org support. Put simply, Opensim is the only thing that listens to port 8002 and answers to http:// requests on 8002. Port 8002 is like port 80, the default port for web pages. You can actually set Dreamworld's 8002 port to 80, and it will work. You can then drop the need to type :8002 at the end of your hyperlink. http://hg.Osgrid.org does this. There would be no need to type the :80, as literally http:// means "add a :80 to the end of it". So only 8002 works with web-based probe tools. If you do switch it to 80, then you forfeit using an additional web server on your home machine. Only one program can listen to a port. If Opensim is not running and your ports are open, it is as if you tried to connect to www.google.com's web server, but their web server is down. Nothing will happen, though your packets can get through the Google firewall because it is still open to traffic and is steering it to a dead server. You will get no answer. Similarly, if Openim is not running, there is no web server to answer the request. This port is heard by Opensim, so regions can chat to the server database for login, presence, and other services such as the region database so people can teleport from one region to another. In DreamWorld, regions must be on the same machine. In Dreamgrid, just like osGrid or any other remotely attachable grid, the regions can run on any machine anywhere in the world. If you opened port 8003 to anyone on the web, you expose the internal database protocol to the web. Anyone with the right knowledge could attach a region to your sim. If you run a DreamGrid and host regiona outside your LAN, it is recommended you use firewall rules to only allow access from know IP addresses running approved regions. 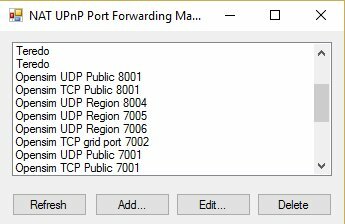 The region ports (8004-upward) run both TCP and UDP. UDP is used for the viewer. UDP cuts the load on the server dramatically as there is no need to automatically always ACK every packet. As one example, no one cares if a audio stream gets briefly interrupted as you cannot hear it anyway, and it is too late to use it if it comes later in a retry. It just gets discarded. You can run Opensimulator without Dreamgrid. Dreamgrid sets up Opensim to run. Once it has run once, you can run Opensim without it. When you click [Start], Dreamgrid looks for a Mysql listening on a specific Port. If it does not see one, it starts Mysql as a separate process. When you exit, it shuts mysql down gracefully with *mysql-admin.-u root shutdown*. Dreamgrid will detect Robust running on Port 8002 and just use it. If it does not see it, Dreamgrid starts up a Robust. For running manually, Mysql can be used in two ways. 1) Mysql\bin\ StartManually.bat runs Mysql manually. Once the Command Prompt opens, this window can be closed manually, as Mysql will run by itself in another thread. This is also useful for diagnostics and manual backups and running a Dreamgrid in folder A on a database in Folder B or C or D:\SomeWhereElse. But there is a serious issue: you need to shut down Mysql gracefully! This really needs to be done correctly to reboot or log out of Windows. The command is *mysql\bin\mysqladmin.-u root shutdown*. There is a batch file in mysql\bin named *StopMySql.bat* that will do this for you. 3) You should install Mysql as a Windows service. There is a batch file *InstallAsAService.bat* in mysql\bin to set this up. Mysql will then start with Windows. This batch file must be run once, as an Administrator. 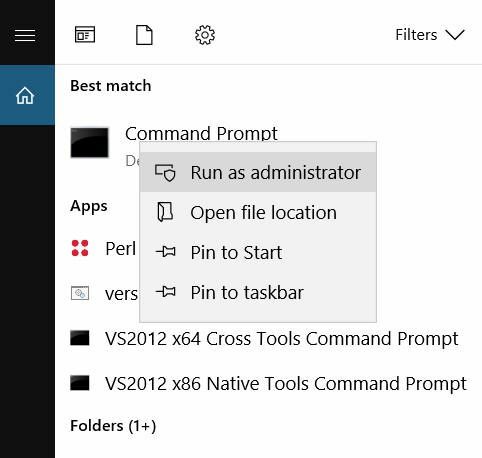 You type "CMD" in the search box, and then right click the Command Prompt and select "Run as Administrator". Use that DOS box to run *InstallAsAService.bat*. Then type in 'Services.msc", and use it to start Mysql. You should also set the service to restart so Mysql restarts on any crash. Windows knows about services, and will send signals to Mysql to shut itself off gracefully. The only danger is that power fails and you corrupt the database, So if you are serious about running a grid, then a UPS is a must. You can start Robust manually, too. Outworldzfiles\RunRobust.bat assumes Mysql is running. Now you do not need Dreamgrid at all. *Go.bat* starts a command prompt with an instance of Opensim in it ( an instance is a set of sims). teh batch file changes to the bin folder, and launches Opensim with the settings it needs for the INI files and the Log file. @remarkable batch file to start Dreamgrid manually. The vast majority of this software is just Opensimlator and MySQL with edits in the INI files to allow auto-configuration by XML and INI editing. The source code package "How_to_Compile.txt" explains how it is compiled, and what changes are made. You need Visual Studio 2015 or higher.